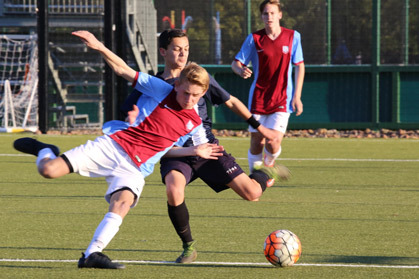 Penleigh Essendon Grammar School (Melbourne) 4 (Stefan Stojcevski 10m; Zaydan Bello 32m, 67m Golden Goal; Will Moustis 36m) beat Westfields Sports High (Sydney) 3 (Rhys Osmond 6minute; Noah Botic 23m, 55m pen). The 2017 Bill Turner Cup final could well be billed as the best of all! I have had the pleasure of witnessing two decades of Bill Turner School Football and many wonderful finales and this year’s was definitely among the best – hard, fast, skilful and gutsy from two classy teams. History will show that Penleigh Essendon Grammar, from Melbourne and in their first National Final Series, were crowned champions. The scores were locked at 3-all at the end of regulation time and it took a seventh minute additional time golden goal to seal the win. There were six goals scored in regulation time – all well executed that had differing sections of the crowd on their feet and cheering. The winning goal came from a searching free-kick – delivered into the penalty box from near halfway by Niko Sikavitsas. Player of the Series and Final – Zaydan Bello – rose above the crowded penalty area to head home the winner! Former Socceroo coach, and a Football legend, Rale Rasic OAM commented post game that he had witnessed a fantastic game of football and saw a squad, from Melbourne, with plenty of raw talent who had played with intestinal fortitude. Toowoomba Grammar School 4 (Luke Lister 2minute, 39m; Eli Adams 28m; Pat McKay 60m) beat Whitebridge High (Lake Macquarie) 1 (Mitchell O’Brien 31m). Eyecare Plus. Your local, professional optometrists.